This page will be updated with our ride impression of the new bikes from the launch and links to the review video when they become available in early June. Keep an eye on Cycle Torque’s Instagram channel and Facebook page for updates. 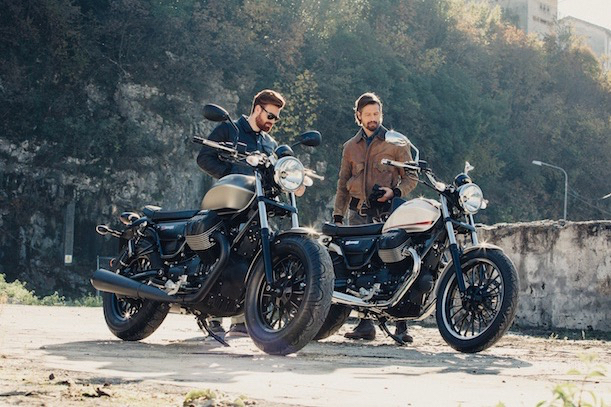 ONE of the most iconic engines in motorcycling, the 90-degree V-twin from Moto Guzzi has been refined, growing into the new V9 which will power two new models.With tastefully retro style, the V9 Bobber and V9 Roamer have just been announced by Moto Guzzi. They will be launched in early June and you’ll be able to follow the event via Cycle Torque’s Instagram channel and Facebook page, with an article a video going live as soon as we can afterward. Both look great and are screaming to be customised further. Moto Guzzi says “An authentic motorcycle in every sense, every component of the V9 has been designed to encompass a quality superior to the competition whilst also enhancing the pleasure derived from riding a motorcycle. “The V9 is the lightest mid-size cruiser on the market and provides supreme handling on the city streets and old fashion fun on the wide open road. The V9 Roamer features gloss pearl paint scheme which have been coupled with chrome mechanical details which is essentially Moto Guzzi. It’s going to be available in three colour schemes and will be priced ride-away at $16,500. “The famous minimalistic style of the Bobber which was made famous in the United States post WWII has been reincarnated by Moto Guzzi in order to create the V9 Bobber. The fusion of blacked out mechanical details, matte colour scheme, 16” matte black rims with an oversized 130 millimetre front tyre and blacked out exhaust weld a distinctive character which is unmistakable. If you are looking for a little bit of soul, look no further. More information on these two new mid-size cruisers from Moto Guzzi can be found at www.motoguzzi.com.au.